This quiet community offers 1, 2 and 3 bedroom units as well as a few single-level units. All units have a park-like view. The heated swimming pool with sun deck is open during the summer months. Several laundry rooms are available for your convenience, as well as locking mail boxes for security, and a neighborhood Albertson's grocery store just steps away. Cats negotiable. Fireplaces available in select units. Close to I-5 and 217, shopping centers, bus lines and Washington Square Mall. Enjoy 97 acres of walking paths, bike paths, playgrounds, basketball courts and natural habitat in the adjoining public park. A community garden has recently been added for your enjoyment. On Tri-Met bus lines, #76 and #78. "It's hard to believe, but it was almost thirteen years ago that our family of four moved into the Park at Greenway apartments. A comfortable place to live, with Greenway Park as a backyard and miles of walking paths. So in 1994, we began renting a second apartment, which I now use as an office. Get up every morning and walk a couple of hundred feet - and I'm at work! Couldn't ask for anything more." "I lived in a house for 30 years and left, sadly. From all the places I looked at, this is the first place I knew I could call home. It feels more home to me than any place. There's beauty; space; people of all ages. I love all the sounds; love the park. Everywhere I look I see green. I like the attitudes of the people here, it has a good spirit. I love the kind of welcoming I received - "Bring your rose bushes!" It's more of a sense of small community rather than apartments." "I've enjoyed my years at the Park at Greenway because of the great location, responsive management, and good rental rates. Living on the greenway with the walking paths and wildlife is a great bonus." 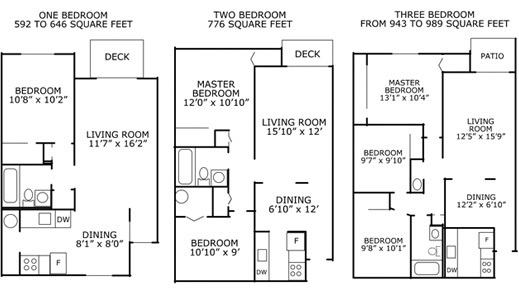 2 bedroom floor plans coming available. Single story and 2nd story, Wet land, community, and park views. Fully remodeled 2 bedroom 1 bath, close to parking, laundry, wet land, seasonal pool, and mature landscaping. No dogs and No smoking. 97 acre wetland with trails, frisbee golf, and bb courts. 1 bedroom floor plans coming available. Ground floor and single story duplex style. Great locations, mature landscaping, close to parking, laundry, wet land, seasonal pool. No dogs and No smoking. 97 acre wetland with trails, frisbee golf, and basketball courts.